What Was The First Color Animated Short Film? Was it a Disney Film? What Was The First Color Animated Short Film? The first major color process for motion pictures was the Kinemacolor process invented in England and used commercially from 1908. Technicolor was first used in Hollywood in 1916, and while the popular competitor Cinecolor was not introduced until 1932, it was based on the existing Prizma Color system used in the 1910s and 1920s and the Multicolor system of the late 1920s and 1930s. Not to mention the smaller processes and various hand-tint methods used. So to think that no animated film used color until 1932 is very short-sighted. Probably the first color film that contained animation is In Gollywog Land (1912), produced in England by the Natural Colour Kinematograph Company in Kinemacolor. This was live-action film with puppet-animated sequences. There is no question that the film was fully (two-color) color, but the actual film is now presumed lost. Another contender (depending on your own definition of what an animated film is) would be Pinto’s Prizma Comedy Revue, which was produced and animated by Vance DeBar Colvig in the Prizma Color system. Again a two-strip color process, and unfortunately, also lost. Vance would soon be known by his nickname “Pinto”, and would go on to an illustrious career at Disney, providing the voices for the Dwarfs Grumpy and Sleepy, as well as creating and performing the voice for Goofy. Well, then Flowers and Trees is the first Technicolor animated film, right? No, sorry to disappoint you, but the Silly Symphonies short is not even that. Long-time Disney collaborator and animator Ub Iwerks had a falling out with his boss in 1930, and struck out to form his own studio. Iwerks first character- Flip the Frog- debuted in the short Fiddlesticks. That debut short was the first animated film released in the Technicolor two-strip process, also becoming thew first animated short to combine color and synchronized sound. So Disney was, in fact, beaten to the punch by his own ex-employee for this first. 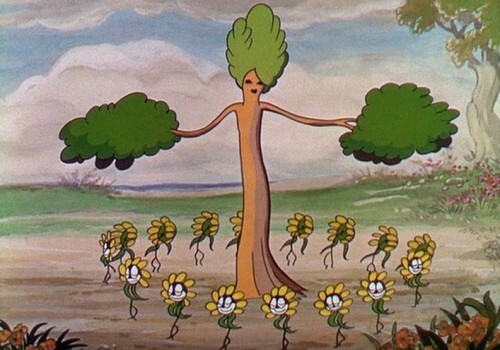 Despite what Disney may tell you, Flowers and Trees was the first animated film released in the three-strip Technicolor process. In fact, Disney films were the only animated films released in the three-strip Technicolor process for the first three years of its availability. Technicolor had perfected the three-strip process by 1932, and they wanted to show it off in style. Technicolor approached Disney and convinced him to shoot one of his Silly Symphony cartoons using the new process. Seeing the potential of the new, full-color Technicolor, Walt Disney agreed to use it, but only if Technicolor offered his studio an exclusive contract. When the3 deal was finally signed, Disney had a stunning new color process to show off his films, and was the sole licensee of Technicolor three-strip system for animation through 1936. Competitors such as the Fleischer Studios, Warner Bros. and Columbia were completely shut out and had to settle for either the less realistic two-color Technicolor system or use the Cinecolor two-color process.